Establish a uniform documentation protocol between the medical community and the schools, for both sports and non-sports related concussions. Develop a training program for healthcare providers focused on the diagnosis and management of concussions. Consider statutory change that would require physicians who manage concussion to complete approved training in diagnosis, management, and return to activity (school and sports). Establish a Youth Sports Advisory Council to address education and regulation of community, recreational and travel sports programs. The existing working groups continue to move forward on these action plan items. The Summit expects to reconvene in November 2013. 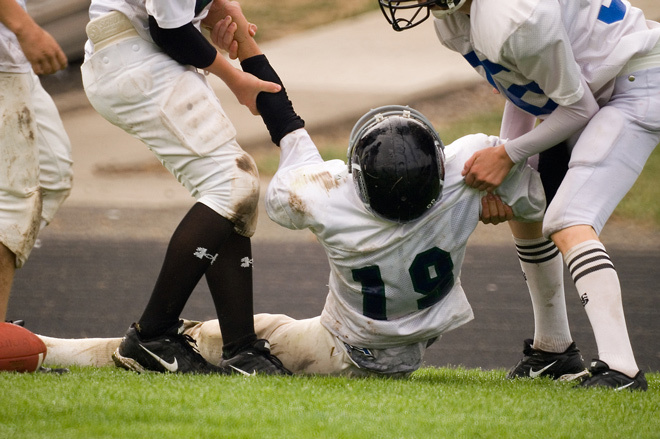 Delaware’s announcement today maintains the state’s momentum on furthering concussion safety. Few state legislatures or agencies have asserted responsibility for community, recreational and travel programs so the Summit’s intent to focus on those sports organizations put Delaware among a select few addressing concussion practices in non-scholastic youth athletics. The continuing interest of legislators who are trained as health professionals has been an important factor. Brandywine School District Superintendent Dr. Mark Holodick noted that his district continues to expand its concussion safety program, with trainers on the sideline, implementing baseline neuro-cognitive testing on all high school athletes participating in contact sports, and practicing preventive measures, such as “heads-up“ tackling techniques, to lower the probability of concussion injury. University of Delaware Blue Hens head football coach Dave Brock, a longtime friend of concussion researcher Kevin Guskiewicz, also attended the press conference to demonstrate support for this youth sport safety initiative. I can’t believe what came out of the meeting conveyed at UPMC the other week concerning concussions , that it’s more advantageous to be active than sedentary when trying to heal head injuries..So all the scientific study’s done over the last say 50yrs means nothing , that rest , sleep heals the brain. Talk about white collar crime ,what a disgrace to mislead people every were to follow a protocol that will cause harm or even ruin someone who has or is experiencing a head injury .. It’s appalling that men of this class or stature would sell out for money , the bible is so true 1 Tim 6 : 10 Niv bible .